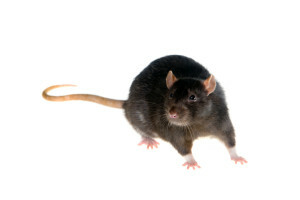 Rats are one of the most dangerous of pests, in terms of disease and threats to sanitation. The most common species of rats in North America are the Norway Rat, also called a sewer or wharf rat, and the Roof Rat. While they are also destructive to property, chewing nearly any substance from wood to the insulation around wires, and even lead pipes, the real problems stem from their poor eyesight. To make up for this shortcoming, rats mark their territory with urine and feces, following the smells to better navigate their surroundings, rather than relying on their vision. Their droppings obviously create a horrible smell, but more importantly, their waste also spreads illness, as do the rodents themselves. Historically, the disease typically associated with rats (primarily the roof rat) is plague. Fortunately, this is no longer the case, plague has not been found in rats in the United States for quite some time. Be that as it may, rats continue to be associated with other transmittable diseases, including Weil’s Disease, infectious jaundice, and leptospirosis (via urine), Salmonellosis (via droppings). Other illnesses include rat-bite fever, which as the name suggests, stems from bites, and rat mite dermatitis, transmitted to humans by mites that have previously been feeding on rats. Norway rats build outdoor nests in burrows under structures such as concrete slabs, or along heaps of rubbish. Indoors, they typically nest in lower areas of homes and businesses, along undisturbed piles of debris or merchandise. However, on occasion, nests may be found in higher places like roofs or attics. We always use child and pet protective bait stations when removing a rat infestation. Usually, these stations are placed in both interior and exterior areas of the structure. Avoiding the use of glue traps limits the sight of dead rats, along with all the other consequences associated with a nearby dead rodent. Therefore, we have a high success rate eliminating rodents without customers suffering discomfort while the process takes place.